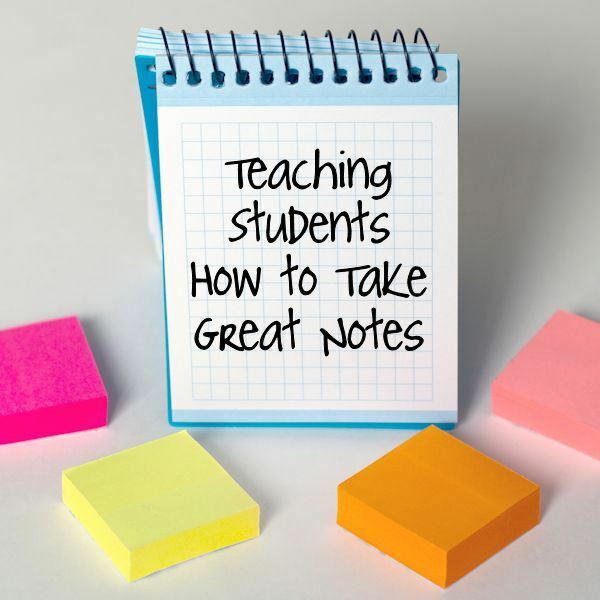 Your student’s grades will improve significantly if you teach them how to take better notes. Engage your students in the lesson with these teaching techniques. SHOW EMPATHY: Try to remember what it’s like to sit in a little desk for an hour, hormones raging, stomach growling, eyes wandering. The more you empathize with your students the better they’ll respond. The best way to do this is ask questions you already know the answer to. For example, “how many of you love sitting at your desk for an hour taking notes on the writing process?” Follow up the question with why taking these notes will benefit them. SHOW ENTHUSIASM: Most teachers care about their subject matter. Most students don’t. They rely on your enthusiasm. Get excited when you teach. Step out of your comfort zone. Do a cheer. Do a cartwheel. Do something other than speak in a monotone voice. GIVE VISUAL CUES: The medium matters little. As long as you provide visual cues, students will know what to write down. If you use Powerpoint, use special effects to highlight what’s most important. If you’re standing at a podium, turn around and write something on the board. Circle things. Draw arrows. Point to stuff. GIVE AUDIO CUES: Phrases such as “this is important,” and “write this down” tell students that you’re about to say something that’s important and should be written down. Voice inflexion, sound effects, animal noises, pounding the podium, and any noise that gives students an extra alert suffices. BE PREPARED: Have everything ready in advance. Scrambling for your notes as the bell rings or loading up your projector 5-minutes into class sends a troubling message to students. It says they’re not important enough to prepare for. Find a partner. Each partner gets a minute to summarize the material. Have them stand up for extra energy. Write answers on individual white boards or chalk boards every few minutes. Stump the teacher. Tell students to create a tough question. Stumping the teacher earns extra credit. MAKE STUDENTS ACCOUNTABLE: How you do this depends on your students. Some students are motivated just knowing the material will be on the test. Other students are motivated by earning points for note-taking. Some students will take notes if they know their notebook is being collected. Some students just want praise for a job well done. Nothing is more frustrating for a student than to do work without some reward. It’s an important skill that teachers falsely assume students can do, but there’s more to taking notes than rattling off a few facts and hoping students learn it. Note-taking is a process that requires outside preparation, in class listening skills, and systematic review for teachers and students.